So, I’m assuming your concept for your spec sitcom ROCKS. But are you structuring it right?? I see a lot of spec sitcoms doing the rounds, but very few pass muster. This is usually because they bear very little resemblance to the sitcoms we see on TV. Usually, they’re what I call ‘COMsits’ – in other words, they’re strings of gags, one after another … All COMEDY and no SITUATION. But it’s called a SITcom. DOH! 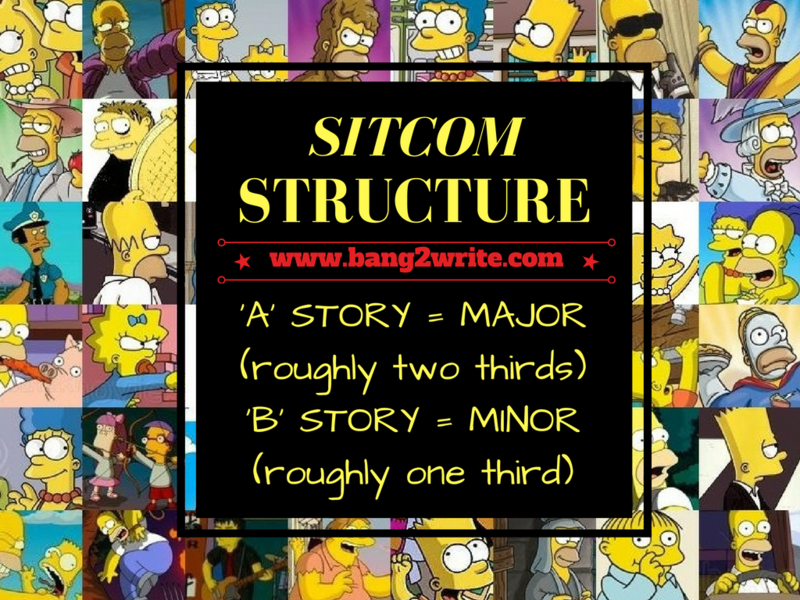 So, I thought I’d take a look at sitcom structure, with reference to the grandaddy of comedy, THE SIMPSONS. Like it or loathe it, this is probably one of the longest running sitcoms, enjoyed by adults and children alike. Plenty to learn here! So, I’m going to look at two episodes from season ten of THE SIMPSONS: Lard Of The Dance and Maximum Homerdrive. Season ten is myabsolute favourite season of THE SIMPSONS, either because it’s pure genius or because my Golden Ager Klaxon needs sounding (possibly both). NOW OBVIOUSLY before we begin, what I outline below is not the ONLY approach to sitcom structure, but it IS the most ‘traditional’ and easiest to grasp in my experience working with the Bang2writers. Note the lack of page numbers. This model can be applied to ANY length script as far as I am concerned, not just features. This means it can be applied to thirty page spec sitcom scripts. Fancy that! 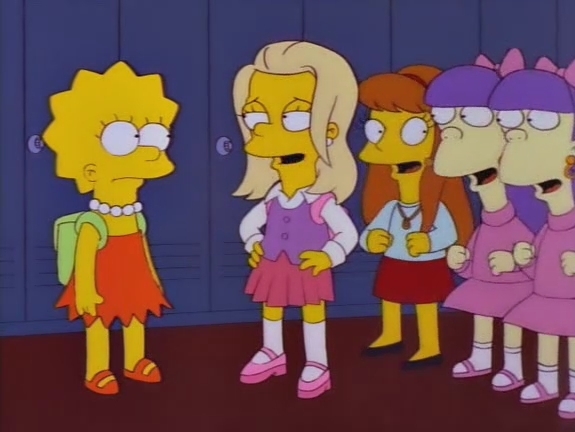 Lard Of The Dance: Lisa has to show new girl Alex (voiced by then-famous Lisa Kudrow) around Springfield Elementary. Alex is sophisticated and cool and Lisa ends up trying to change herself to try and impress her and everyone else. This includes organising a schooldance instead of the usual school annual apple pick. However by the end of the episode, Lisa realises it’s important to act her age and so does everyone else. 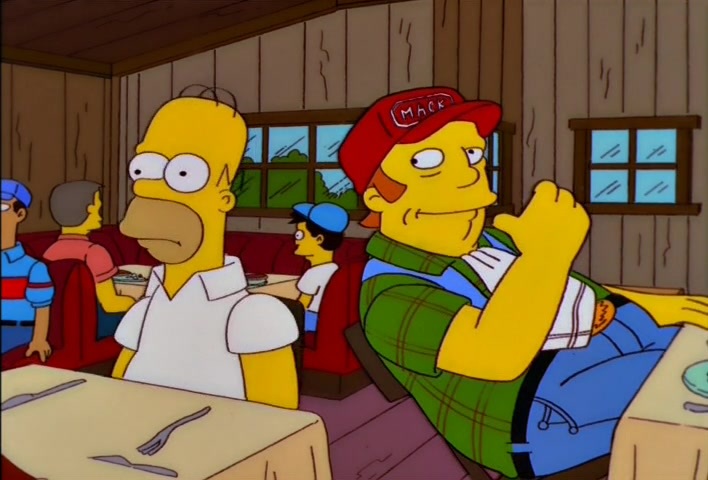 Maximum Homerdrive: Homer is in an eating competition with a trucker, Red, who dies as a result. Homer ends up honouring Red’s last delivery, taking Bart with him. They discover a scam: truckers have a special box that drives the truckfor them! Homer promises to keep schtum but of course blows it, bringing the truckers after them. 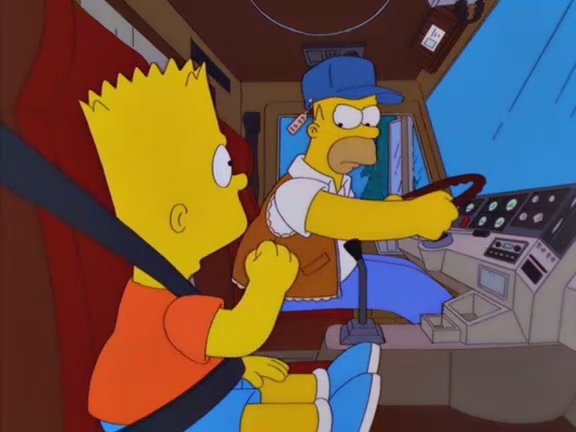 Homer manages to get out of this and wins the truckers’ respect by the end of the episode. SUMMING UP: Your ‘A’ Story is the MAJOR FOCUS of the episode. It will probably take up something between 60-75% of ‘story space’ in your episode. So if you need a MAJOR FOCUS, it stands toreason you need a MINOR as well, right? Yep! This is where the ‘B’ story comes in. Lard Of The Dance: Homer and Bart decide to make money by selling grease. 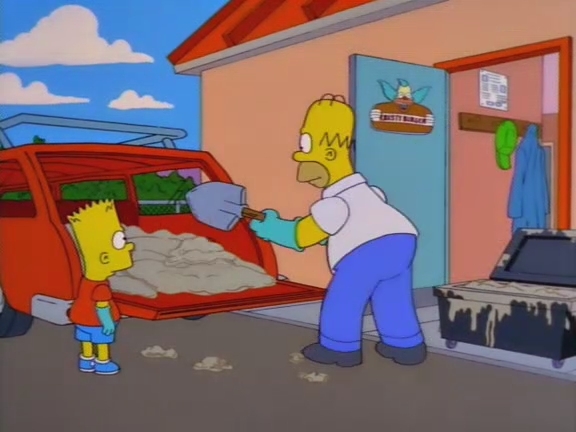 They fail at this until Bart suggests one last big score – draining the fryers at Springfield Elementary. Homer agrees and they break in at night, but are foiled byGroundskeeper Willy who has earmarked the grease for his retirement. There is a big fight between Willy and Homer and they end up in the air ducts of the school. 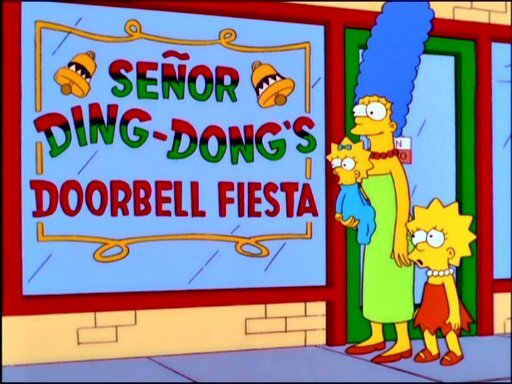 Maximum Homerdrive: Whilst Homer and Bart are on the road, Marge and Lisa buy a novelty doorbell from local doorbell salesman Senor DingDong. At first, Marge enjoys the novelty doorbell chime, which sings Close To You by The Carpenters. But she and Lisa – and the entire Springfield neighbourhood – are driven to distraction when the chime won’t stop. This is when the mysterious Senor DingDong turns up and lashes it with his whip, finally stopping it. SUMMING UP: Your ‘B’ story will take up what’s left of the ‘story space’ in your spec sitcom – anything between 25-40%, usually. Lard of the Dance: Marge takes the kids Back To School shopping, setting up the fact Alex will be coming to Springfield Elementary as a new pupil. This also prompts Homer to buy a hotdog and discover about grease having value. Maximum Homerdrive: The Simpsons go to a new beef restaurant,where Homer will undertake the eating contest that will kill Red,the trucker… Meaning Homer will deliver the contents of his truck instead. MacGuffins don’t HAVE to be comedic (Hitchcock used them to good effect in his thrillers), though THE SIMPSONS are famous for them (I hardly ever see them in spec sitcoms either, so for this reason alone you could differentiate yours from the rest of the pile!). SUMMING UP: A MacGuffin is a great way of showing your comedy – and structural! – chops as a screenwriter. 4) ONE character pushes either story forward! Sitcoms are frequently ensembles, but generally speaking, ONE character will push the story forward in each thread. In Lard of the Dance, it is Lisa; in Maximum Homerdrive it is (surprise!) Homer. By the same token then, ANOTHER character pushes the story forward in B – it won’t be the same one as in the ‘A’ story. In Lard of the Dance, Homer is the one pushing the ‘B’ story forward; in Maxmum Homerdrive, it is Marge. SUMMING UP: Pick one (different) character to push each thread forward, otherwise you’ll tangle your plot – and yourself! – up in knots. 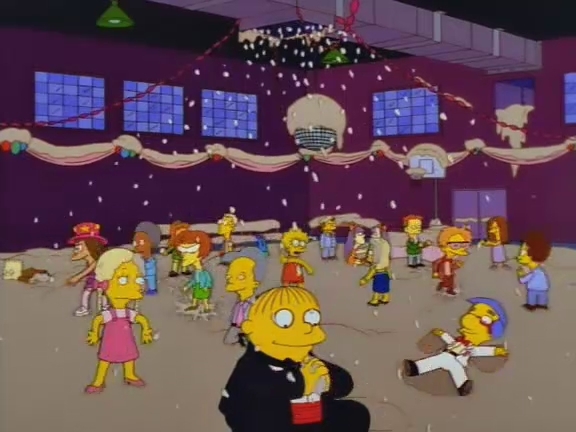 In Lard Of The Dance, BOTH the ‘A’ Story and the ‘B’ story merge when Lisa’s dance and Homer’s fight with Groundskeeper Willy over the grease LITERALLY EXPLODES! In Maximum Homerdrive however, once Homer and Bart are out on the road, the ‘A’ story and ‘B’ story remain separate, all the way until the end credits. Homer and Bart deliver the truck and get on a train to come home; whereas Senor DingDong ‘rescues’ Marge and Lisa (and the rest of Springfield) and then FADE OUT. SUMMING UP: You don’t have to merge your two stories in your spec sitcom … BUT if you want yours to stand out?? DO IT. Part of the convention of sitcom states that the story HAS TO return to the ‘status quo’ by the end of the episode. That’s why so many sitcoms start and end up in LITERALLY the same place – ie. round the kitchen table; in a cafe; down a hole where the characters may recap what they’ve ‘learnt’ during the episode. THE SIMPSONS is no exception in this, though the ‘status quo’ has become impossibly broad over the years, with episodes ending on desert islands; in space; even in Heaven and Hell. After all, the status quo in this sitcom is that BASICALLY ANYTHING CAN HAPPEN. SUMMING UP: Returning to the ‘status quo’ is important to sitcom structure, so make sure you do it – and the reader KNOWS it. So that’s your crash course to sitcom structure! So, what are you waiting for? GET GOING! This is so obvious once it’s written down!